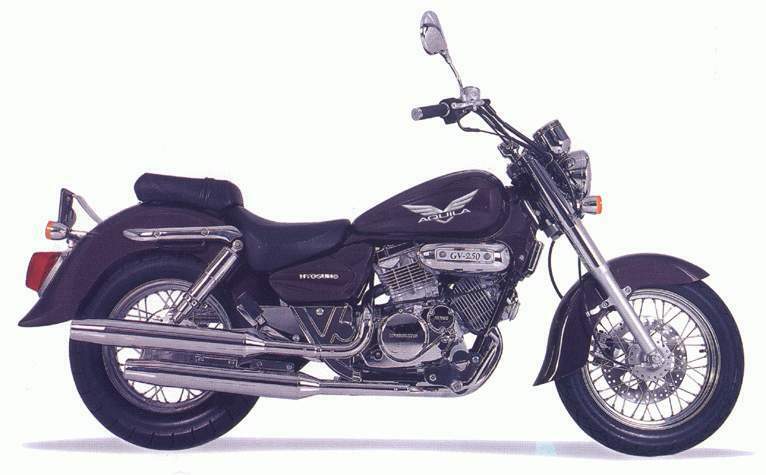 We had a crack at Korean manufacturer Hyosung's latest - the mighty XRX175 - a few months ago and reckoned it was okay. Meanwhile the GV250 Aquila cruiser suggests this is not a brand to be taken lightly. The sometimes unforgiving Australian market has been through the adventures of accepting Russian, Malaysian and Korean brands in the car market over the past 20 years, and it's the Koreans who have staked out a serious claim. China might be next. When it comes to motorcycles, the Koreans have a head start - if spouse Margaret is any indication. She teaches learner riders for fun and a modest profit on her weekends and has got to like the GV250 from Hyosung. The XRX was interesting, and about what you'd expect from a bike in that class, but the GRV shapes up as a serious challenger in the all-important learner sector. She did most of the miles on the test example and, given she's ridden every learner and middleweight bike that's passed through the Guido garage in the last five years (plus most of the biggies) has an interesting perspective on the theme. According to Ms M, the GV is a good, friendly, thing. Let's have a squiz. The basics are an air/oil-cooled V-twin four-stroke powerplant running conventional carburetion, wet clutch, five-speed transmission and chain final drive. It all hangs off a steel frame, with basic suspension and a single front disc/rear drum braking package. Now that lot may not be calculated to get the pulse racing, but we've got a fair bit of sympathy for the idea of using proven ideas rather than attempting to reinvent the wheel. Particularly if you are, like Hyosung, a relatively new kid on the block. Styling is pretty good. It's a variation on the popular long and low look with deeply valanced guards and fairly flash-looking cast wheels. The two-tone paint on our example added to an overall feeling of value for money. As a ride, there's nothing to complain of. It feels robust and entirely predictable, with decent response from the suspension. Shorter riders will love the 695mm seat height, while taller folk may be less thrilled with a saddle that's literally at knee height. At 190cm, I could cope with the ride position - at least you don't get tangled in the bars on full-lock turns - but would be happier with something taller. Performance is adequate. It will do 100-110km/h all day, and will get to 130 without too much fuss - not the quickest 250 out there, but in the realms of respectable. Overall the packaging is good. 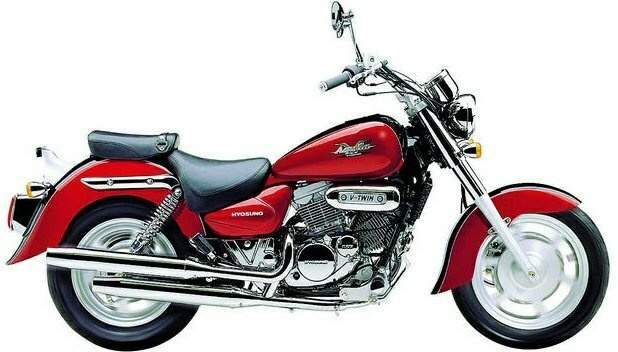 There are some details which could do with refinement, such as the handlevers. They need changing to adjustable items. But for a $6700 ask, we reckon it's a bit of a sleeper on the 250 market. There's plenty of value there and other manufacturers have every reason to be watch this brand closely.